Newcastle are 19th in the table, three points from safety with eight games remaining. West Ham's Darren Randolph, 28, came off the bench to replace Elliot on Tuesday. Republic manager Martin O'Neill could recall Shay Given, who has recently returned to training after a knee injury. 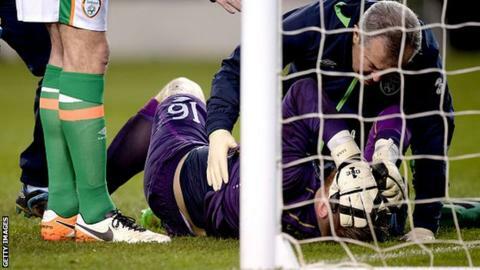 The Stoke keeper, who will be 40 on 20 April, was working as a television pundit at Tuesday's game and spoke to O'Neill about his recovery.